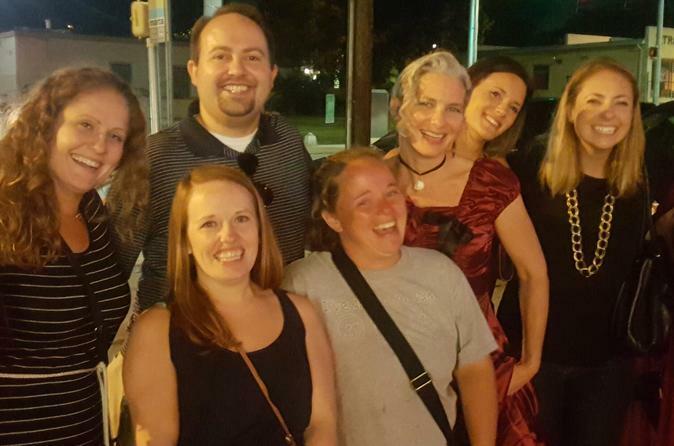 Our Atlanta haunted pub tours are perfect for a great night out. Whether you are a true lover of ghosts or just up for a fun night out, our tour has a little bit for everyone. Costumed guides will lead you on a 2.5 hour (approximately 0.75 mile) round-trip walking tour across from Oakland Cemetery. You will stop at four different bars and have time to enjoy an alcoholic beverage while the guide regales you with spooky tales of ghosts sighted in and around Oakland Cemetery as well as some of the amazing history that downtown Atlanta has to offer! Our tour starts at Republic Social House, a bar which rests right in the middle of Atlanta’s oldest and largest historic district, Grant Park. Much of the district’s size is due to Oakland Cemetery, which houses approximately 70,000 departed souls. This will be our intimidating companion all through the night as all our stops are located directly across from the cemetery. Everyone will have the opportunity to grab a drink and meet the costumed guide, either a Southern Belle or Southern Gentleman, beside the courtyard fountain. From there we will walk to three more bars, where guests will be given the option to grab a drink before hearing stories. Drinks are not included as part of the tour but the group will spend 20-25 minutes in each location to give guests plenty of time to enjoy their beverage should they wish. Though the cemetery is closed after dark, guides will bring you up to its intimidating gates while they tell you about the roll call of the dead and the Confederate soldiers who still roam the area. There will also be trivia and candy prizes along the way for the winners! Our tour ends at Six Feet Under, which is right near the first stop, and has a kitchen that is open late so food as well as drinks are an option.